My friend Isabel (aka Grushenka of Grushenka i Alyosha) came over today, ostensibly to study physics, but really to bake and play some Beatles Rock Band. She is a pie baker, and I am in love with my new non-stick cupcake tins, so we decided to make miniature pumpkin pies in the cupcake tins, which we intend to bring to our Russian-folk-song-singing club/group/thingy. And, in honour of the approaching festivities of next weekend (i.e. Halloween), we gave the pies miniature stems and faces so that they looked like jack-o’-lanterns (ok, in retrospect it might’ve been wiser to draw those on with frosting for better accuracy). After a taste test, we agreed that these were absolutely delectable, and would make an excellent dessert for any fall gathering. 1. Prepare the pie crust: chop the butter into 1/4″ pieces. In a large mixing bowl, cut the butter and flour together until the mixture resembles coarse meal. Adding the ice water 1 table spoon at a time, mix with the flour-butter mixture until the dough holds together. Wrap in plastic wrap and refrigerate. 2. Prepare the filling: in a large mixing bowl, blend together the cream cheese, pumpkin, eggs, sugar, vanilla, cinnamon, nutmeg and ginger and beat until smooth. 3. Preheat the oven to 350oF. Roll out the dough to about 1/16″ thickness. Using a nonstick muffin tin, cut circles large enough to fill each cup. Line the muffin tin with the dough circles. 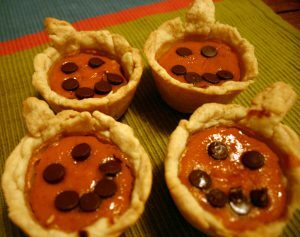 With the extra dough, make the stems, and press into the dough-lined cups to attach. Fill each 3/4 full with filling and decorate with the chocolate chips. Bake 18-20 minutes, until the filling is set and the crust is golden brown. Remove to a wire rack to cool completely, then remove from the cups, taking care not to break the stems in the process.